Chic Runner - Are those freckles? The other day I set out to run my allottedfive and a half miles, got about halfway done when my Nike+ passed away, bummer, I know. RIP, but alas, I moved on since I knew the route and how far I had left. It was dusk and the run was amazing. I felt good, pushed the last two miles pretty hard and when I got home I grabbed my normal glass of crushed ice and water and thought about taking a shower. A closer look showed that my face had become a GNAT GRAVEYARD. They dotted my face and had gotten stuck in my sweat. Talk about taking a shower. Other than that I purchased a new Nike+ and it works great! 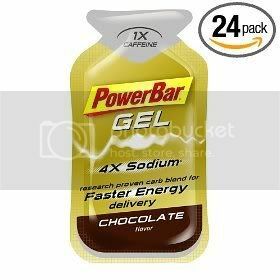 I also tried the a new powerbar gu flavor, Chocolate. That was disgusting, so I wouldn’t recommend it.